Have you got both breakers working? Turn them off and then on. Is the timer or relay board doing its thing? What about the thermostat? Follow the diagram on the back of the unit with a multitester. Be aware of the fact that 220 V can kill. Next check the heating element itself with a meter for continuity OHMS CLOSED CIRCUIT. If not its defective or has a short if its grounding out? Which in turns causes blown fuses or thermostats or overheating. Check the thermal cut off, the cycling and the hi limit thermostats. For continuity or OHMS. If no ohms or resistance they need replacement. Lastly check your moister sensor. ( located inside the dryer door usually) Especially if machine seems to shut down early and clothes are still wet. Test with a meter at room temperature and it should show continuity. A failed moisture sensor will affect the dryer run time in the automatic moisture sensing cycle but it will not affect the heating of the dryer or the timed cycle. Which are reflected by the thermostats. Next check the heating element itself with a meter for continuity OHMS CLOSED CIRCUIT. If not its defective. I replaced fuse, high limit thermostat and thermal cut off, still heater does not cycle on and off, just gets hotter and hotter., is this the thermistor or something bigger? I would first check to see if the heating element is shorted out. When the vent or blower housing of the dryer get built up with a lot of lint the dryer won't vent out the heat properly and it can cause the heating element to warp and short out against the cabinet. To check for a shorted element you should unplug the dryer and remove the bottom panel. On the right side you will see the heating element, remove the two wires that connect to the element. With a multi-meter, check to see if you have continuity from either side of the element to the cabinet that hold the element. You should NOT have continuity when you check for this, if you do the element is shorted out and will need to be replaced. You can also pull out the element and do a visual inspection, sometimes you can see where the element coil is touching the housing. When the element is shorted out, it will continue to heat when the dryer isn't calling for heat. They will even heat with the dryer not running, so make sure to unplug it for safety reasons. If your dryer won't heat up, it's possible that it is not being supplied with the proper voltage. Here are three ways to make sure power is getting to your dryer: First, make sure your dryer is plugged in. Next, check the circuit breaker panel to make sure all the circuit breakers are in the correct positions. Finally, check to make sure no fuses in your fuse panel are blown. Any of these could explain why power is not getting to your dryer. It is possible that your dryer isn't heating because its heating element is defective. Heating elements are irrepairable. If yours has ceased to function properly, you will have to replace it. Open your dryer's cabinet and locate the heating element so that you can test it. How to open a dryer cabinet. How to test a dryer's heating element. How to replace a dryer heating element. the terminal bracket that secures it may need to be replaced. Also check to see if the thermal fuse is blown, if both volt circuits are on and the thermostats are functional. Step Check the vent. If a load takes longer than one hour to dry clear the vent duct of any obstructions. Determine if the heating element is partially burned out . would get a new element anyway ok? you may have shorted you thermal fuse. or the overload that is attached to the element housing. Good luck. Dryer won,t heat, put in new element and still won,t heat. Kitchenaid superba dryer won't heat Where is the heater fuse located? Q - My electric dryer runs but will not heat, what could stop my dryer from heating? - house fuse or breaker ( needs two of them ), heating element, burnt wire, thermostat(s), thermal fuse ( not all models ), motor heat switch, timer, selector switch, burnt power cord/plug. A ohm meter test for these parts is here. Q - My gas dryer will not heat, what could stop my dryer from heating? - glow bar igniter, thermal fuse ( not all models ), coils on the gas valve, gas valve, thermostats,motor heat switch, timer, selector switch, sensor. A page for checking gas dryers is here. Meter testing and usage tips. 1. Power supply-check power supply at terminal block where cord enters the dryer. Should read 240V. If you read 240V here, tested with a volt meter, unplug dryer and test components with ohm meter. 2. Thermostats-Cycle and safety thermostats-read them with an ohm meter. Should show continuity . How common thermostats work. 3.Timer-The timer has a set of contacts that pass voltage to the heaters. If you can not determine by wiring picture what they are, check across the two terminals with the largest wires on them. The heater wires are almost twice as large as the others. You should read continuity with timer in heat mode. 4. Thermal fuses-In recent years the makers of dryers are using thermal fuses to let you know something is wrong with your dryer. They are generally non resetting and have to be replaced. 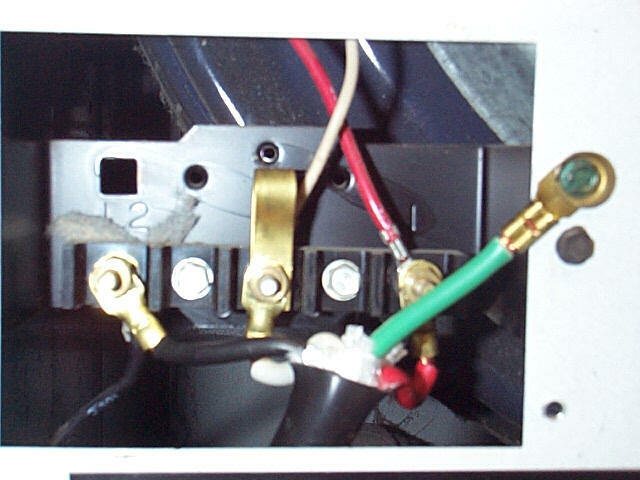 The thermal fuses are located on the heater element housing and should read continuity if read with an ohm meter. Most blown thermal fuses are the result of vent/air flow problems or a grounded heating element. 5. Selector Switches-Read the wiring picture and determine which switch is closed. You should read continuity across closed switches. 6. Safety Switch on Motor-There is a safety switch on motor to insure that heaters can not come on unless motor is running. It is normally open when the motor is idle/not running, and closes when motor runs. In order to check with an ohm meter, remove the two large wires on motor switch and make them electrically safe. Tape them. Plug the dryer in and start motor. Check continuity across the terminals on the motor switch you removed the heavy wires from. If it is ok you should read continuity. Remember that the smaller wires in a dryer carry the 120V and the large wires carry 240V. There is no voltage on these two terminals with wires removed. It is ok to test with ohm meter. 7. Heat elements-Test heater element with an ohm meter. You will read continuityacross a good element ( 8-12 ohms is an average element ). To check the thermal fuse - You can bypass the thermal fuse (just connect the 2 wires together) for testing purposes only.To check the thermal cut-out - You can bypass the thermal cut-out (just connect the 2 wires together) for testing purposes only. To check the thermostats for continuity - - You can bypass the thermostat (just connect the 2 wires together) for testing purposes only. To check the Element: Try removing element and physically looking at the element wire for a break in the wire. First make sure you have power to the unit through the plug. If power is present, then you most likely have an open Thermal Safety Fuse. The Thermal is a Safety feature that shuts off the power to the Heat Element in the event the Blower is not blowing or the Lint Vent becomes clogged not allowing air to flow over the Heat Element. NO air flow, Heat Element over heats, Thermal Safety Fuse opens, power shuts off. If the Thermal Safety Fuse is open find out why. Was the blower not working? Was the Lint Filter clogged? ( Lint Filter should be cleaned after each use to assure continued air flow.) Was Lint Vent Clogged? This is the Vent Hose that goes from the Dryer to the outside of your house. It should be checked for free air movement. The next thing-- Could be a defective Timer or Control Module. Find where you lost power and WHY!! GE Profile Harmoney Front Load Electric. There are 6 control buttons on the dashboard. The two on the left side of the display screen, the BACK and HELP buttons are the only ones that are working. The four on the right of the display do nothing when pushed. Since the START/STOP button is one of those four, we can't start a dry cycle to dry our laundry. The touchscreen works fine. Two times I have been able to get it to start just by pushing the button over and over, but now that won't work either. Have a manual for GE Profile Harmony DPGT750EC Electric Dryer?